The following article is embedded from our Facebook page https://www.facebook.com/CAAInc. This year the 2018 meeting of the American Association of Clinical Anatomists is being held in Atlanta, GA., at the Grand Hyatt Buckhead Hotel and Conference Center. The program is full of interesting topics and is already a hit with all the attendees. Looking forward to the program. UPDATED: An esophageal hiatus hernia (also known as a hiatal hernia) is caused by a dilation of the esophageal hiatus and its component structures, the phrenoesophageal membranes (ligaments). Since the intraabdominal pressure is higher than the intrathoracic pressure, abdominal contents -usually stomach and greater omentum- can herniate through the dilated esophageal hiatus into the mediastinum, the central region of the thoracic cavity. This presents as a hernia sac whose walls are formed by endothoracic fascia, phrenoesophageal membranes and parietal peritoneum. There are two main types of esophageal hiatus hernias. Type I is known as a "sliding hiatal hernia" and is characterized by a complete ascension of the esophagogastric junction and abdominal esophagus into the thoracic hernia sac. This is usually accompanied by a typical "hourglass image" in a radiographic assessment, and also presents with gastroesophageal reflux disease (GERD). Type I esophageal hiatus hernias are more common. The accompanying images above depict a Type I esophageal hiatus hernia. The superior image shows the hernia in situ where the stomach and greater omentum are still in the hernia sac. The inferior image shows the contents reduced and the abdominal esophagus being pulled into the abdominal cavity. The dotted line shows the dilated esophageal hiatus that needs to be repaired to prevent recurrence of the pathology. The image below answers a question by Victoria Guy Ratcliffe, who asked via Facebook "What would it be if it feels like you've got a blockage right at the level of the heart? That's too high for a hiatal hernia, isn't it? " The image answers the question. It shows a dissection of the left side of the thorax. The anterior thoracic wall and the left lung have been removed. The heart is immediately superior and anterior to the esophageal hiatus, and the hernia sac of a Type I esophageal hiatus hernia is seen immediately posterior and in contact with the heart. Whether this means that you will "feel" the hernia, it is up for debate, as all these structures have visceral innervation. Most probably, a well-developed Type II esophageal hiatus hernia might interfere with swallowing at this level, causing the sensation she mentions. Thanks for the question, Tori. For additional information: "Approaches to the Diagnosis and Grading of Hiatal Hernia" Kahrilas et al Best Pract Res Clin Gastroenterol. 2008 ; 22(4): 601–616. In the case of the respiratory diaphragm, there are seven such openings, seven normal hiatuses. On top of this, you can find an abnormal opening caused by incomplete congenital closure of the dome of the diaphragm, a congenital diaphragmatic hernia (CDH), also known as Bochdalek's hernia, found in the posterior aspect of the respiratory diaphragm. • Hiatuses (2) for the superior epigastric vessels, which are the inferior continuation of the internal thoracic (mammary) vessels. Also known as the hiatuses of Morgagni. A hernia in a newborn through this hiatus is also considered a CDH. Based on the above it is wrong (maybe not wrong, but incomplete) to say that a patient has a "hiatal hernia", as the term does not include which hiatus is involved. In fact the hernia of Morgagni is also a "hiatal hernia" as the hernia passes through a normal defect in the respiratory diaphragm. Come to think of it, it could also be a hernia in a hiatus somewhere else in the body, such as a hernia of Schwalbe, a type or pelvic diaphragm hernia. Note: Thanks to DHREAMS of the Columbia University Medical Center for the link on CDH. UPDATED: The esophageal hiatus is one of the seven hiatuses found in the respiratory diaphragm allowing passage of structures between the thorax and abdomen. As it name implies, the esophageal hiatus is the passageway for the esophagus. It also allows passage of the anterior and posterior vagus nerves, (CN X). The hiatus is bound by two muscular crura, both of which arise from the right tendinous aortic crus. Since the intraabdominal pressure is higher than the intrathoracic pressure, there is a series of structures at the phrenoesophagogastric junction to close the esophageal hiatus. The infradiaphragmatic parietal peritoneum reflects off the diaphragm towards the stomach to form its serosa layer (visceral peritoneum). At the same time the infradiaphragmatic fascia, also known as the endoabdominopelvic fascia, splits into two components or limbs. These are the superior and inferior phrenoesophageal ligaments or phrenoesophageal membranes. (the root [-phren-] means "diaphragm"). These phrenoesophageal ligaments create a disc-like plug between the abdomen and the thorax. This "plug" is reinforced by a circular infradiaphragmatic fat pad. The phrenoesophageal ligaments are reinforced on their thoracic aspect by the endothoracic fascia. 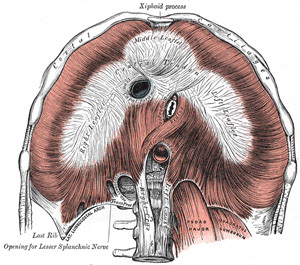 The lower esophagus has a dilation (evident in the image) called the "esophageal ampulla", in relation to this dilation the circular muscle layer of the esophagus slightly thickens creating the so-called "lower esophageal sphincter". This area is not a true anatomical sphincter, but rather is a functional sphincter. The esophagogastric mucosal junction shows a marked transition in the shape of a wavy line. This is called the Z-line or the ora serrata. Extensions of the gastric mucosa and submucosa inferior to the ora serrata create a valve-like flap called the "gastroesophageal flap valve". When viewing this mucosal flap through and endoscope, it looks corrugated and flower-like, hence it is also called the "rosette". The congenital or pathological dilation of the esophageal hiatus can predispose to esophageal hiatus hernia. The word acetabulum is formed by the combination of the Latin root [acetum], meaning "vinegar", and the Latin suffix [-abulum] a diminutive of [abrum], meaning a "cup", "holder", or "receptacle". Thus formed, the word acetabulum means "a small vinegar cup". Roman soldiers liked to drink their water mixed with a small quantity of vinegar, so as to reduce the sensation of thirst. This mix was called "Posca". An acetabulum was used to add specific quantities of vinegar to the water, so over time the acetabula (plural form of acetabulum) were considered measuring devices. It is said that they measured one cup, or 2 1/2 oz. of wine. The anatomical acetabula are bilateral cup-like depressions in the os coxae which serve as a component of the coxofemoral joint (hip joint). They are found at the intersection of the three bony components of the os coxae, the ilium, ischium, and pubic bone and look anteroinferiorly.